MBA student Jeff Coles blogs about his experience studying abroad in Barcelona. It is nearly impossible to go anywhere without witnessing this city's rich history. After a short trip through Thailand and celebrating New Year's Eve with a group of Sternies, I finally made it to my humble abode in Barcelona, Spain. It's almost like being back in the Lower East Side, but brighter. 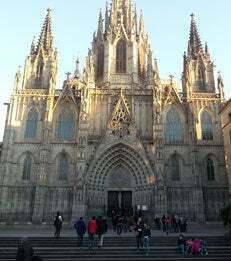 A short distance from my apartment is the Cathedral of the Holy Cross and Saint Eulalia. It is nearly impossible to go anywhere without witnessing this city's rich history. After an intense three days of classes at the ESADE MBA program, I needed a break. Jack Tirado (MBA '13) and I braved the cold weather and a three-hour bus ride for a weekend of skiing. I usually ski, but I tried out the snowboard this time. To finish out my first month abroad, I took a trip out to Madrid to visit a friend who is currently working at the embassy. We stopped by Chocolateria San Gines for some of the best churros in Spain. My girlfriend flew over to view some of the sites in this huge city. This is a picture of us in front of the Alcala Gate in the center of the city. My first month abroad in Spain has been full of new experiences. Immersing myself in a society so rich in culture and working through a critical point regarding their role in the European Union is extremely exciting. I can not imagine the new experiences and opportunities that will present themselves in the coming months.